This is a rare chance to experience a green tea tasting, a local sake tasting, a tea ceremony at an important historical teahouse and many other activities with your guide who will explain to you about the long history of Matsushima as a sightseeing spot due to its beautiful landscape. Matsushima is also known as a historically important location for being the base of the shogunate during the Sengoku (Warring States) period. 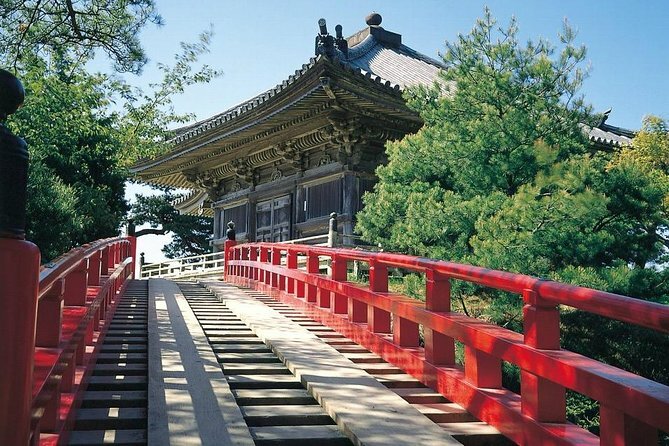 This tour includes both one-way bullet train and local train tickets. Enjoy the relaxing train ride as well as beautiful rural landscape in Japan! After Matsushima became a base of the warrior, Masamune Date's, family, they built a number of impressive facilities. One of them, Zuiganji Temple, is registered as National Treasure and is known as a symbol of Matsushima. This area was beloved by Masamune Date due to it being an excellent port city and the hundreds of islands and sunken rocks in the area preventing the invasion of enemies. It is thanks to these islands, Matsushima suffered relatively little damage from the tsunami that followed the great earthquake of March 11th, 2011. Arrive at Tokyo station before 6:45 AM (recommended) and look for Tohoku bullet train (shinkansen) platform. 7:16 AM - Take a bullet train (shinkansen) from Tokyo station and start this relaxing full-day tour in Matsushima. Transfer at Sendai station to JR Senseki line. 9:40 AM - Arrive at Hon-shiogama station and your friendly and knowledgeable local guide will be waiting for you at the ticket gate. 10:00 AM - Walk to a famous local green tea store for a unique "green tea tasting" experience. You will have a chance to taste a few kinds of high-grade green tea that is served at luxurious hotels and ryokans, as well as a sake-based green tea cocktail. 11am - Visit a local sake brewery.If you are traveling on Sunday, as the sake brewery is closed on Sunday, your guide will take you to a short sightseeing boat ride in Matsushima Bay instead. You will visit a local sake brewery that is famous nationwide and hear about their history, the manufacturing process of sake and types of sake. Also have a chance to taste a few kinds of sake. A tea ceremony experience at the Kanrantei Tea House or Senshin-an. After your tea ceremony experience, you will go on a walking tour of Matsushima. You will visit local historical sites with a guide. This is a great opportunity to learn about the local lifestyle. Some places you will visit include Zuiganji temple (National Treasure and Important Cultural Property), Godaido Temple (Important Cultural Property), Entsuin temple and, if time allows, the Pine Tree of "Saigyo Modish".